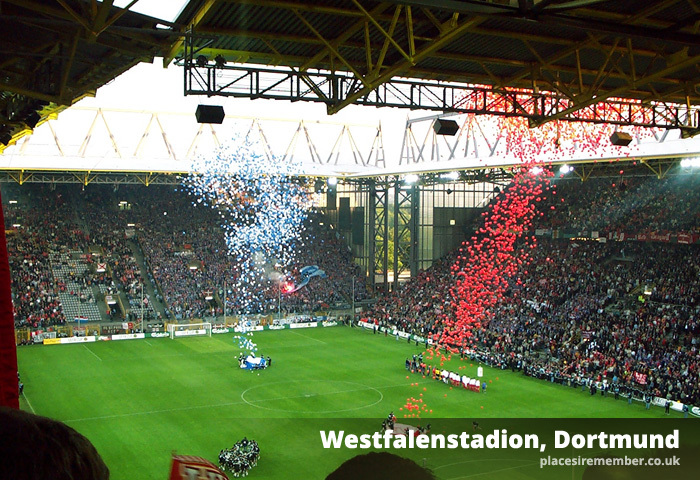 UEFA Cup Final 2001, Dortmund. A first football match away from Anfield, the first match attended on my own, and the first time I had travelled abroad; Having only just turned 20, the first experience of football on the continent was a slightly daunting occasion. It was also the first of what has become a growing number of occasions that events in France have led to delays on flights that I’ve travelled on. Fog in Paris caused severe delays to the arrival of Corsair flight CRL814, the chartered Boeing 747 service that would be taking me and my fellow football fans to Münster-Osnabruck. Originally scheduled to be one of the first flights out of Liverpool Airport, it was eventually the last to depart, and there wasn’t a huge amount of time to spend in the city once reaching Dortmund, following the second stage of the journey – a 75 minute, thoroughly dull coach transfer along the German autobahn into Dortmund. The footballing story of May 16th 2001, however, was anything but dull. Facing Liverpool in the final was Club Deportivo Alavés from Vitoria-Gasteiz, a city located in Northern Spain, and capital of the Basque Country. The modest size of Liverpool’s opponents certainly had its advantages for Reds’ fans in terms of ticket availability. Alavés had much smaller crowds and season ticket holders numbering only 13,000, so not all of the club’s ticket allocation was sold. Most of the returned tickets were subsequently snapped up by Liverpool fans, who occupied all but one end of the stadium. Alavés were participating in European football for the first time in their history, but their progress had seen them defeat Serie A giants Inter Milan, and Kaiserslautern of the German Bundesliga. Their free-scoring team had impressed with their attacking game, but they were not expected to cause Liverpool’s mean defence as many problems, and therefore went into the game as massive underdogs. 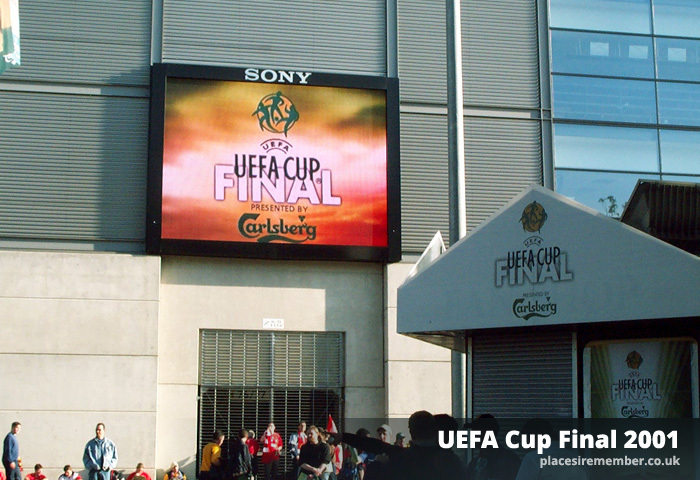 In contrast, Liverpool had battled their way to the final with defensively solid displays that had earnt its share of high-profile critics, not least of whom was Johan Cruyff, the Dutch legend and father of Jordi Cruyff – who was a key member of the Alavés team. Most of the criticism was unjustified given that Liverpool, too, had reached the final against the odds. The route to Dortmund saw the Reds face runaway Serie A leaders Roma in the last 16, before a quarter final with Porto and a semi final against Barcelona. The latter two ties were against teams originally involved in the Champions League, and both were vastly more experienced than a Liverpool side who had missed out on European football entirely during the previous season. Progress in all three ties was achieved in a large part due to a defence which kept five clean sheets out of the six games against three of Europe’s strongest teams. Yet a narrow aggregate lead against Roma created a tense finale, and an intense second half at home to Barcelona was enough to test the nerves of even the calmest of Liverpool fans – with a Gary McAllister penalty gaining an advantage that would have been overturned in an instant had Rivaldo’s Barcelona netted an away goal at Anfield. If getting to the final was challenging, then providing the competition with winners that would be accepted by the continent’s football followers would also be difficult. Neutrals understandably wanted a fairytale ending for Alaves’ entertaining campaign, while also hoping that the final wouldn’t be won in the dull manner that had been associated with Liverpool’s UEFA Cup ties. If any such fears were genuine, they needn’t have been. Liverpool raced into an early 2-0 lead and looked set to achieve a scoreline more fitting of a rugby match until Alavés pulled a goal back – only to then concede a penalty that allowed Liverpool to restore their two-goal advantage before half time. But the second half began with Alavés netting twice from set pieces, and the outcome was again in doubt. Robbie Fowler’s strike in front of the designated Liverpool end dealt another blow to Alavés, but in the last minute of the match, the Spaniards secured a dramatic equaliser: 4-4. For a short period around the turn of the century, a golden goal rule was in force for any period of extra time. The first team to score would win, and the match would end at that point. 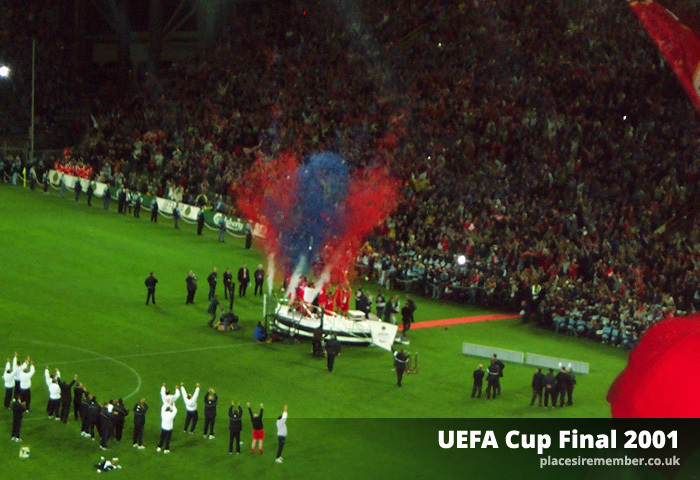 That was the scenario facing the sides, and it was Liverpool who grabbed the all important goal – the only major European final to be decided in such a way before the rule was scrapped – and with it, a record-equalling third UEFA Cup win. Almost more exciting for me was that the win had earned Liverpool a match against the European Champions in Monaco during the summer of that year, and an opportunity for me to visit one of places I most wanted to see. But a first overseas trip and a European final producing a match that will forever be remembered for its drama, was an experience in itself that I’ll never forget.